Grimm's World is a 1969 science fictionnovel by Vernor Vinge. In 1968, Damon Knight published Vinge's novella "Grimm's Story" as part of Orbit 4. Knight told Vinge that if he expanded the novella to book-length, then he would get Vinge a contract with Berkley Books, where Knight worked as a science fiction editor. Vinge wrote an extension, and it became his first published novel. In 1987, Vinge revised the novel for Baen Books and added a new opening section, changing the title to Tatja Grimm's World. Originally found in Orbit 4, 1968. Vernor Vinge (1969). Grimm's World. Berkley Medallion. ISBN 0-425-01750-8. Vernor Vinge (1978). Grimm's World. Littlehampton Book Services Ltd. ISBN 0-600-34083-X. Vernor Steffen Vinge ( ( listen); born October 2, 1944) is an American science fiction author and retired professor. He taught mathematics and computer science at San Diego State University. He is the originator of the technological singularity concept as the phrase is now used and perhaps the first to present a fictional "cyberspace". He is best known for his Hugo Award-winning novels and novellas A Fire Upon the Deep (1992), A Deepness in the Sky (1999), Rainbows End (2006), Fast Times at Fairmont High (2002), and The Cookie Monster (2004), as well as for his 1984 novel The Peace War and his 1993 essay "The Coming Technological Singularity". Vinge published his first short story, "Bookworm, Run! ", in the March 1966 issue of Analog Science Fiction, then edited by John W. Campbell. The story explores the theme of artificially augmented intelligence by connecting the brain directly to computerised data sources. He became a moderately prolific contributor to SF magazines in the 1960s and early 1970s. In 1969, he expanded the story "Grimm's Story" (Orbit 4, 1968) into his first novel, Grimm's World. His second novel, The Witling, was published in 1975. Vinge came to prominence in 1981 with his novella True Names, perhaps the first story to present a fully fleshed-out concept of cyberspace, which would later be central to cyberpunk stories by William Gibson, Neal Stephenson and others. His next two novels, The Peace War (1984) and Marooned in Realtime (1986), explore the spread of a future libertarian society, and deal with the impact of a technology which can create impenetrable force fields called 'bobbles'. These books built Vinge's reputation as an author who would explore ideas to their logical conclusions in particularly inventive ways. Both books were nominated for the Hugo Award, but lost to novels by William Gibson and Orson Scott Card. 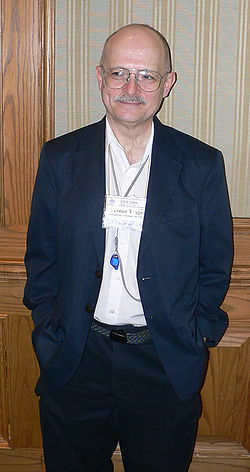 Vinge won the Hugo Award (tying for Best Novel with Doomsday Book by Connie Willis) with his 1992 novel, A Fire Upon the Deep.A Deepness in the Sky (1999) was a prequel to Fire, following competing groups of humans in The Slow Zone as they struggle over who has the rights to exploit a technologically emerging alien culture. Deepness won the Hugo Award for Best Novel in 2000. His novellas Fast Times at Fairmont High and The Cookie Monster also won Hugo Awards in 2002 and 2004, respectively. Vinge's 2006 novel Rainbows End, set in a similar universe to Fast Times at Fairmont High, won the 2007 Hugo Award for Best Novel. His next novel was released in October 2011. The Children of the Sky is a sequel to A Fire Upon the Deep, set approximately 10 years later. Vinge retired in 2000 from teaching at San Diego State University, in order to write full-time. Most years, since its inception in 1999, Vinge has been on the Free Software Foundation's selection committee for their Award for the Advancement of Free Software. Vernor Vinge was Writer Guest of Honor at ConJosé, the 60th World Science Fiction Convention in 2002. His former wife, Joan, is an accomplished science fiction author. ^ Saffo, Paul (1990), "Consensual Realities in Cyberspace", in Denning, Peter J., Computers Under Attack: Intruders, Worms, and Viruses, New York, NY: ACM, pp. 416–20, doi:10.1145/102616.102644, ISBN 0-201-53067-8 . Revised and expansed from "Viewpoint", Communications of the ACM 32 (6): 664–65, 1989,doi:10.1145/63526.315953. ^ ab "1985 Award Winners & Nominees". Worlds Without End. Retrieved 2010-08-12. ^ ab "1987 Award Winners & Nominees". Worlds Without End. Retrieved 2010-08-12. ^ abc "1993 Award Winners & Nominees". Worlds Without End. Retrieved 2010-08-12. ^ abcd "2000 Award Winners & Nominees". Worlds Without End. Retrieved 2010-08-12. ^ "2002 Award Winners & Nominees". Worlds Without End. Retrieved 2010-08-12. ^ "2004 Award Winners & Nominees". Worlds Without End. Retrieved 2010-08-12. ^ abc "2007 Award Winners & Nominees". Worlds Without End. Retrieved 2010-08-12. ^Interview with Vernor Vinge, Norwescon website, October 12, 2009. ^ "Vernor Vinge's sequel to A Fire Upon The Deep coming in October!". ^ "Guests of Honor". ConJosé (the 2002 Worldcon). ^Vinge, Vernor. Introduction to "The Peddler's Apprentice", a story by Vernor Vinge and Joan D. Vinge, in True Names ... and Other Dangers. Baen books, New York, 1987; ISBN 0-671-65363-6. ^ "1992 Award Winners & Nominees". Worlds Without End. Retrieved 2010-08-12. ^ "1999 Award Winners & Nominees". Worlds Without End. Retrieved 2010-08-12. ^ "The Coming Technological Singularity: How to Survive in the Post-Human Era". Whole Earth Review (Winter 1993). 1993. ^ Vinge, Vernor (March 23, 2006). "2020 Computing: The creativity machine". Nature. 440 (411). Bibcode:2006Natur.440..411V. doi:10.1038/440411a. ISSN 0028-0836. PMID 16554782. Retrieved February 14, 2017. ^ Vinge, Vernor (June 30, 2004). "Synthetic Serendipity". IEEE Spectrum. ^ Vinge, Vernor (26 February 2015). "BFF's first adventure". Nature. 518 (7540): 568. Bibcode:2015Natur.518..568V. doi:10.1038/518568a.